If you would have filed as Single this year, support your household, and had a baby, your filing status could change to Head of Household (HH). Not only does the HH filing status give you a larger bump in standard deduction, but HH has more favorable tax brackets as well. That means for the same dollar amount of income, you could be paying less taxes as HH instead of Single thanks to your new bundle of joy. However, if you are married, having a child will not generally affect your filing status. For more information on the requirements for your filing status, please see IRS Publication 501. Parents are typically showered with gifts and money from friends and relatives to celebrate the birth of the child.. The good news is that these gifts are not taxable. However, if your rich relative gifts more than $14,000 (in money or property) to any one person during the year, he or she may be subject to gift taxes and need to file a gift tax return. 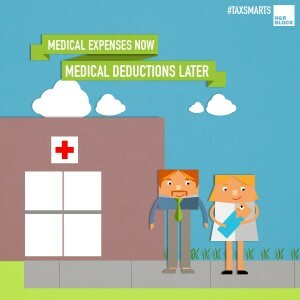 Medical expenses can be deductible if they exceed 10% of your adjusted gross income. Most parents are aware that the cost of the hospital stay to birth your baby and related care will count as medical expenses. But mothers are surprised to find out that the cost of breast pumps and lactation supplies are medical expenses that may help you reach up and over that 10% hump. However, you’ll need to itemize these expenses in order to qualify for this deduction. You are required to include the social security number (SSN) of any dependent you claim as an exemption on your tax return. If your baby does not have yet a SSN, you should apply for an SSN as soon as possible by filing Form SS5, Application for a Social Security Card, with the Social Security Administration (SSA). It usually takes about two weeks to get a SSN once the SSA has all the information it needs. If you do not have the required SSN by the filing due date, you can file Form 4868, Application for Automatic Extension of Time To File U.S. Individual Income Tax Return, for additional time (up to six months) to file your return. That infant is not only dependent on your for food, clothes and shelter, they are also a dependent on your tax return! For most taxpayers, claiming your little neonate may shelter $3,950 of your income from tax in 2014 through an additional dependency exemption. If you are in the 33% tax bracket, this deduction can save you up to $1,303. The IRS provides a tool for you to use to help you determine if someone is your dependent on your tax return. With higher education costs skyrocketing, it’s never too early to start saving. 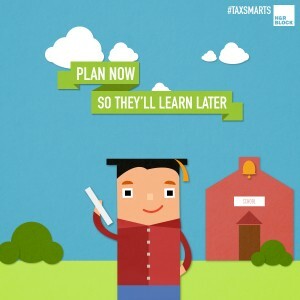 Qualified tuition programs (QTPs, also called “529 plans”) are programs offered by many states that allow you to either prepay or contribute to an account for paying a student’s qualified education expenses at a postsecondary institution. If you prepay tuition, the student (known as the designated beneficiary) will be entitled to a waiver or a payment of qualified education expenses, which are tax-free (even the earnings!) to the extent of qualified education expenses incurred during the year. Unfortunately, you cannot deduct the payments or contributions to a QTP at the federal level, but you might be able to deduct these at the state level depending upon where you live. This credit may be as much as $1,000 per qualifying child depending upon your income and filing status. Since children are known to be expensive, paying less in taxes means more diapers or better toys for your baby. For requirements to claim this credit, be sure to visit IRS Publication 972. This credit could land a taxpayer with three or more qualifying children up to a maximum amount of $6,143 as a refundable credit for 2014. If you claim the credit without children, your credit is much, much lower. As with any tax benefits, you and any qualifying children must meet the specific requirements to be eligible. If you are, the credit amount is based on your total income, the types of income you received, and your filing status. Use the EITC Assistant to find out if you are eligible, if your child is a qualifying child, and estimate the amount of the credit you may get. Visit IRS Publication 596 for more information. If you employ a nanny or caregiver to help care for your newborn, you may need to comply with additional filing requirements. There are federal and state employee withholding taxes you must understand if above certain amount in wages ($1,900 for 2014) is paid to a household employee. See IRS Publication 926 for more information. If you paid someone to care for your child while you worked, – like a daycare center – you may be able to claim the Child and Dependent Care Credit on your federal income tax return. This credit is based on your amount of earned income and can be up to 35% of your qualifying child care expenses, up to a max amount of $3,000 per child up to $6,000. Of course, there are specific requirements that are laid out in IRS Publication 503. This credit may also be reduced if you receive tax-free dependent care benefits from an employer.